American Special Jazz Bass, 4-string bass guitar from Fender in the Jazz Bass series. "Fender American Special Jazz Bass"
A friend of mine bought it for his home studio, he wanted a basse that would be easy to play so as to play it himself on demos when producing other artists. Considering the Jazz Bass as THE reference for that purpose, he jumped on this model which was available at the nearby shop. He bought it new for slightly under the 1000€ mark. 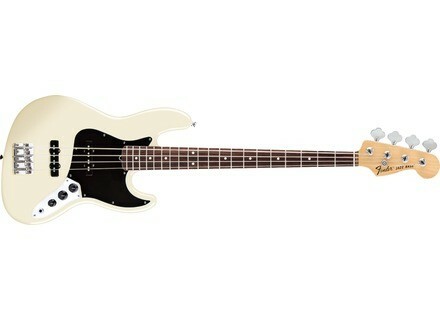 The model in question is white with a black pickguard and rosewood fingerboard. Rather on the lightweight side, this bass is well balanced and the neck is pleasant and comfortable to play. However, when you play in unplugged you notice a lack in volume and a rather unpleasant, twangy sound. OK, it’s not plugged in yet, but you’d expect a certain “bare” sound quality from a passive bass at that price. Well, that’s not the case so you’ll have to depend on the pickups, which do manage to compensate a bit yet can’t do miracles. Technically, I must admit this US Fender doesn’t give me the same feelings that other instruments from the same range that I’ve tried did. I even find it less charm than a Mexican model and a less convincing look compared to a made-in-Asia “Classic Vibe” one (which is way less expensive)! I won’t even bother comparing it to my ’71 Jazz Bass, and I tell myself that for the same price you’d get a much better instrument from other brands. I’d already been disappointed with recent Fender instruments, and i feel that the brand has its customers play lottery for getting a great instrument from them, and that’s a real pity. I’m sure you can find American Special instruments that sound amazing, but that’s not the case of this one, which is a little so-so considering the price.